Good job to Miki for qualifying as PADI Scuba Diver! Home/News, PADI Scuba Diver Course/Good job to Miki for qualifying as PADI Scuba Diver! 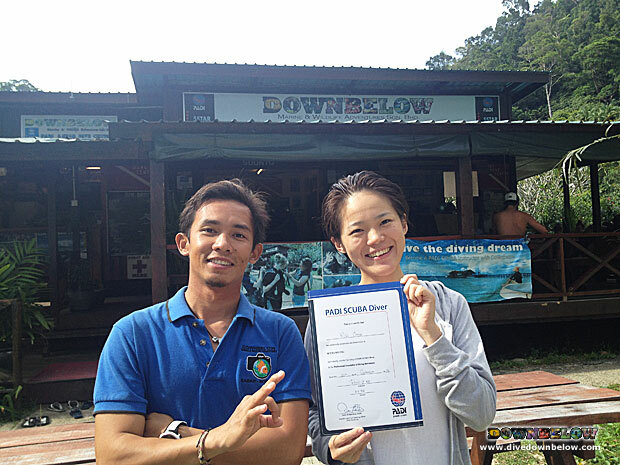 Miki is one of our international clients from Japan who has completed her PADI Scuba Diver qualification in 2 days at our premier PADI 5 Star IDC Dive Centre on Gaya Island. Recreational diving has never been so accessible, and so flexible to offer even the busiest of career-oriented clients options to upgrade and continue dive education with convenience. Experiencing open water scuba diving can be achieved in a 1-day program, PADI Discover Scuba Diving, and to certify as PADI Scuba Diver as Miki has, it only takes one more day! Her PADI Instructor Pablo is one of our dedicated and experienced members of our island team of professionals, who has impressed the value of Miki continuing her dive adventures. We’re sure to see Miki again in the near future to upgrade to the PADI Open Water, which will only take one day! Travel experts of our Head Office will arrange a detailed itinerary with your own personal convenience in mind for you to achieve your Borneo adventures! By Joanne Swann|2014-09-29T13:47:52+08:00September 27th, 2014|News, PADI Scuba Diver Course|Comments Off on Good job to Miki for qualifying as PADI Scuba Diver!